Men's plain white tees can be more than underwear - they can be a versatile piece of clothing perfect for a variety of casual occasions. Even though this item of clothing sounds incredibly simple to wear, many men have found a variety of ways to sport the plain tee. When some people think of a tee, they instantly imagine the functional and inexpensive cotton T-shirts that often come in a three- or six-pack that many guys wear under their regular shirt. When worn this way, a tee is a useful piece of underwear. If you wear a light-colored dress shirt for the office, wearing a white tee underneath not only helps avoid any embarrassing transparent incidents, but it also prevents perspiration from staining your work shirt. 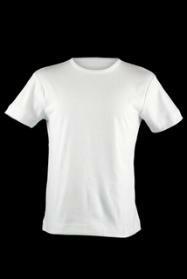 You can find plain cotton T-shirts anywhere men's undergarments are sold. They're usually inexpensive and can stand up to multiple washes, including with bleach. The soft cotton feels great next to the skin and is a durable material. If you're looking for a casual tee to wear, but you don't want to look like you've left the house in your undershirt, you can buy plain white tees made for wearing out. While many men wear actual undershirts as regular tops, often under long-sleeved plaid or flannel shirts, some guys want to wear a plain tee that can't be confused for underwear. In spring or summer, the light color will keep you cool and comfortable. With your favorite shorts or jeans, you can sport your white tee with sandals or sneakers. For an inexpensive white tee that will pair well with different pants or shorts, Gap stores sell these items all the time, in long-sleeved and short-sleeved versions. In cooler weather, wear a plain tee under your crewneck or V-neck sweaters for additional warmth. Whether you wear a white T-shirt as an undergarment or you like sporting one as part of a casual ensemble, caring for it properly will keep it as bright and clean as the day you bought it. Unless the care instructions say otherwise, most white tees should be washed in hot water with detergent and bleach. If you have stubborn stains on your shirt, treat them with a spot cleaner before washing. Cotton is made to hold up well to repeated cycles in the washer and dryer, but you might want to check for a "preshrunk" label when you buy-otherwise, your tees may shrink in the dryer and you'll need to buy a larger size to accommodate the shrinkage. Besides being a classic men's undergarment, the cotton tee is also a classic casual top that can be easily accessorized. While it functions well as a casual piece, you don't want it to look sloppy, so make sure you run a warm iron over it if it's especially wrinkled. Other than that, it's simple to just slip into a white T-shirt and go, whether you wear it as an undershirt or a regular top, just about any time of the year.